Everyone dreams of their perfect house. Some people want the picket fences and others want 12 foot high concrete walls. Some want the wood shingles while others want copper roofing. It’s fun to watch home renovation shows to see what finishes people pick for their ultimate dream home. Sometimes people are predictable and pick the same stuff as other families, like glass tiles, brushed nickel faucets, hardwood floors, etc. All of that sounds nice, but after a while it’s stuff you don’t notice much. Personally, I’m ok with just pretty tile. It doesn’t matter to me if it’s porcelain or stone or glass or mirror (mind out of the gutter) or steel. Flooring is there to be abused, so I would prefer something less flamboyant than flooring made from tips of koa trees harvested by monkeys fed exclusively on organic bananas. No, there’s no such thing. Well, koa wood is a real thing, but waaaaaaaaaaaaaaaay too expensive. But for me, a dream home has to be good for the long run, and there are far more important things to get than the “oooooh…SHINY! !” things. 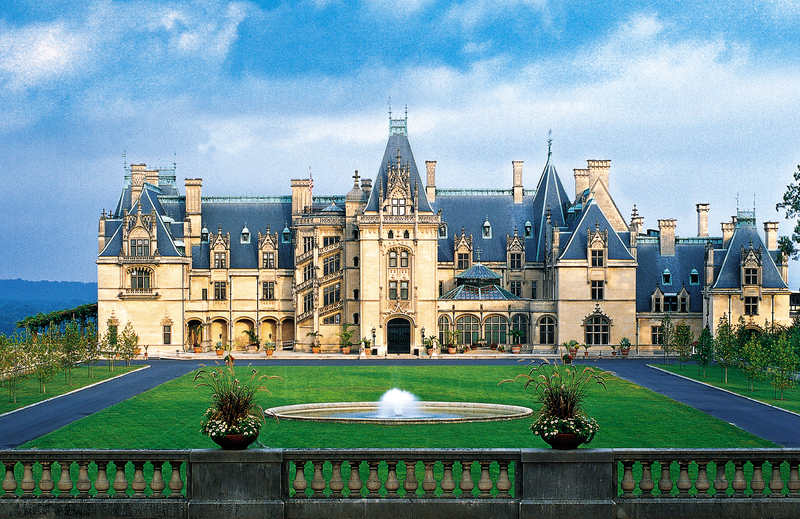 Yeah, not everyone can live in a Biltmore. My perfect house would have flooring that never scratches, breaks, chips, or stains. I’m talking titanium tiles. The windows need to be made from borosilicate and made with the same stuff in Transition™ lenses. In the living area, the fireplace will be gas, and the gas will be pumped from the local fracking area. The TV will be inset into the wall so that I never have to dust it again. The sound system will be optional so that if he wishes to hear it, I can turn my side off and save my hearing. I will not have a conventional HVAC system. I want a geothermal system, and along with that, every bathroom will have its own tankless heater. And heated floors. And towel racks. The master bath will also have a big, BIG tub. Not just a soaker, but one you have to wait two hours to fill. In the kitchen I want an Aga™ with three ovens, and seven burners and two griddles. Why? Because. Moving on, the sink will have a disposer with a two quart capacity and a Saab Turbo™ motor. The counters will be made from cement and zinc. If I have to slam a cast iron pot on the counter I want any damage to look like it was done on purpose. And finally, the very last thing I need I need in my dream home is a dryer that folds clothes. They had one on Lost in Space and I need the technology to catch up, pronto. This entry was posted on Wednesday, January 21st, 2015 at 4:28 PM	and tagged with innocent-fun, live-like-you're-dying, where's-the-apron? and posted in Home Improvement, Randomness. You can follow any responses to this entry through the RSS 2.0 feed. I know what an Aga is. I want a house that faces North made of limestone, geothermal in-floor heating, some solar on the sunny side, an indoor pool with a rubber curtain that lets you swim to the outside pool. I’ll need a 2000 square foot garage with a thirty foot ceiling and in floor heating. An eight foot by four foot shower with heads at both ends and slate tile. Copper roof. A bar with beer taps, a dishwasher and a shrine for my Classic Malts. A screening/gaming room with copper ceiling tiles.and several wall mounted televisions. Stone floors everywhere. A limestone flagstone pad in the back yard with two fire pits. One for groups of two to eight, one for council fires they can see from orbit. I don’t know what an Aga is or how to do the ™ thingy. But…you did the ™ thingie…. Pffft. My mind has to clean up to rise up TO the gutter level! A one room shack, with a wood stove. There will be a giant shed out back full of beans, & a pneumatic tube that provides me with a whole, live pig for slaughtering & cooking every time I push a button. I’m going to push that button a lot, too. Wouldn’t you rather have it powered by an Electro-Motive Diesel engine? That would never jam. Aggs check this out – the morons at Ace’s are brutally trolling Fat Michael Fat Moore Fat on Twitter. Thread and comments are priceless.